This flaxseed square tastes just like apple pie. Lightly spray a 15 x 10 inch (40 x 25 cm) baking sheet with a non-stick cooking spray. In a large bowl, mix together all-purpose flour, salt and flaxseed. Cut in shortening until mixture is crumbly. Stir in egg yolk and milk until a soft dough forms. Divide dough in half. On a lightly floured surface, roll one half into a 15 x 10 inch (40 x 25 cm) rectangle to fit the baking sheet. Place on prepared baking sheet. Sprinkle cornflake crumbs over dough. Peel, pare and slice apples. Spread apple slices on top of crumbs. Sprinkle sugar and cinnamon on top. Roll out other half of dough, lay on top of apples to cover. Crimp edges all around to seal. Beat egg white until frothy, brush on top of crust. Bake 35 to 40 minutes or until golden brown. Cool. In a small bowl, mix together icing sugar, water and vanilla or almond extract; stir well. Add a few drops of water if needed to form a drizzle. 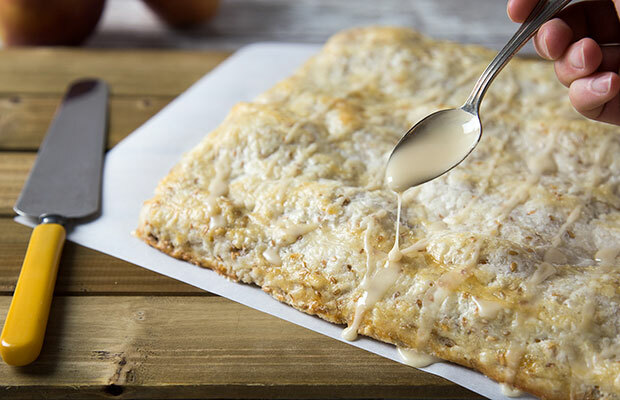 Using a spoon, drizzle icing over square. Cut into 30 squares. Serving Size: 1 square. Each serving contains 1/2 tsp (2 mL) of flax.